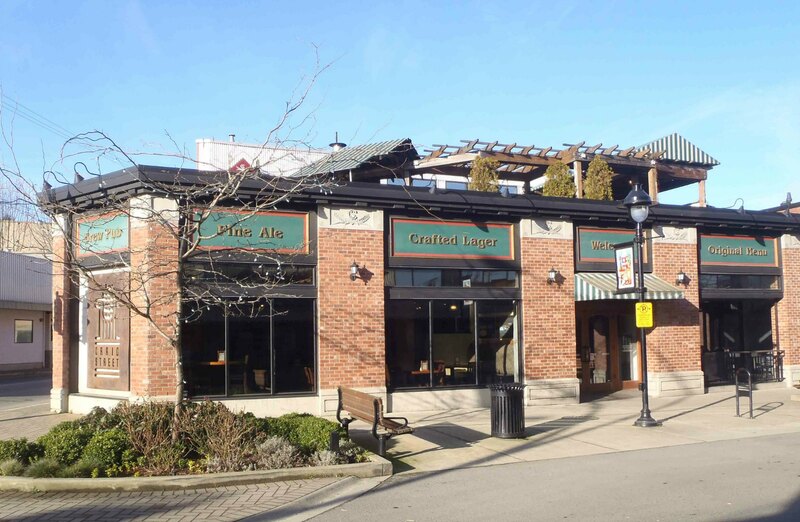 25 Craig Street is now the Craig Street Brew Pub, a popular downtown Duncan restaurant and pub which brews its own craft beer on site. The Craig Street Brew Pub has been in the building since 2004, but 25 Craig Street also has an interesting history going back to 1929. 25 Craig Street was designed and built in 1929 by Vancouver architect William Frederick Gardiner (1884-1951) as a gas station and garage for the Home Oil Company of Vancouver. Today this may seem an unlikely location for a gas station and garage but it made complete sense in 1929. At that time, the intersection of Craig Street and Government Street was part of the Island Highway, which, at that time, was the main north-south road transportation corridor between Victoria and Nanaimo. The intersection of Craig Street and Government Street was the first Duncan intersection north bound travellers would encounter, so there was an excellent business case for a gas station and garage here. 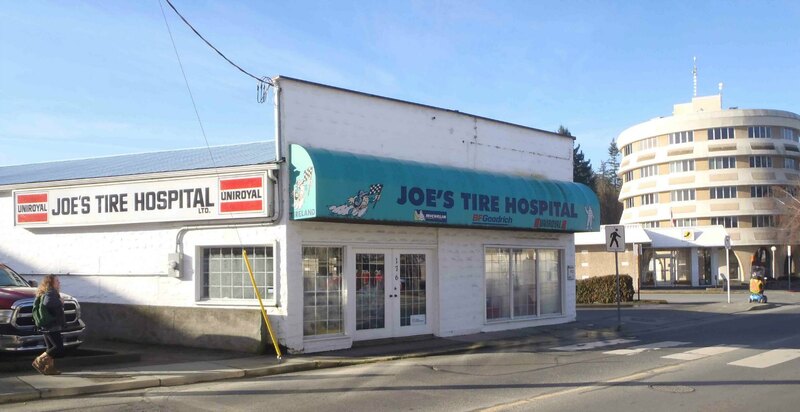 Another long established Duncan automotive business which started nearby using a similar business case is Joe’s Tire Hospital at 176 Government Street, started by Joe Drennan in 1930. “Occupied by Clark Motors Limited, the new Home Oil building, situated at the corner of Craig and Government Streets, opposite Cowichan Merchants Ltd, is another fine addition to the business section of Duncan. It was opened last week. Attractive in appearance, the building is arranged and constructed along the most modern lines. Thus, utility and beauty have been combined. Approximately 65 feet square, with a slight taper towards the corner, the garage is built throughout of reinforced concrete. The architecture is Spanish in style and, in addition to the general lines, a pleasing effect is given by the green tiles on the roof of the service canopy, these being in imitation of the clay tiles of Spain. The service station has two gasoline pumps and the usual air and water lines. It occupies the corner point and there is access from both streets. On the Craig Street side of the building is the spacious show room, well finished, and lighted with two large show windows. The floor is of 24 inch large red tiles. Behind the show room and opening into the repair shop is the stock room, well fitted with an array of shelves and bins. In the centre section of the building, opening off the service section, is the oil office and, behind it, are two general offices. On the Government Street side, in front of the shop and a continuation of the service space, is room for washing, oiling and greasing. Here a hydraulic hoist is part of the built-in equipment. The repair shop occupies the eastern half of the building [note: this must be a mistake; the eastern side of the building bordering Craig Street was the showroom. The repair shop would have been on the western side of the building.] Throughout the garage all the latest conveniences have been installed. All machines will be run by air or electricity and proper outlets have been provided for their use. The pumps are automatic electric, the compressor is of the latest type. A grease pit in the shop provides additional facility for underneath work when the hoist is already in use. An important feature is the electric installation. The lighting effect, both interior and exterior, is quite striking. As fitting for the building. Clark Motors Ltd. have installed up-to-date equipment in their repair shop. This includes an electric valve refacer, a valve seat reamer, and a cylinder hone, for tuning up motors; a 35-ton hydraulic press for straightening axles and pulling off tight bearings, an engine stand, an electric machine for use in relining brakes, a high pressure grease gun and an air and water washing gun. Equipment for battery charging and repairs has also been put in, while, in the tyre department is an electric tube vulcanizer with capacity for four tubes at once. In addition to handling all Home Oil products, Clark Motors Limited are also distributors of Ford cars, trucks and parts. A large and complete stock pf parts has been put in. Mr. W.K. Clark is managing director fo the operating company and on the staff are his son, Mr. M.B. Clark, service manager; Mr. A.V. Warren, sales manager; Mr. A. Fielding, accountant; Mr. J. Jacobson, head mechanic; Mr. A. Lawless, tyre and battery man; Mr. J. Fox, parts department. Home Oil Distributors Limited, in erecting this substantial building and installing first-class permanent equipment, have shown an evident faith in the development of Duncan and the Cowichan district. They are to be congratulated upon their own growth as a 100 per cent western Canadian company, of which evidence is given in the large and steadily growing chain of service stations. A modern refinery stands on the north shore of Burrard Inlet, where Home Gas is manufactured and there is a central depot from which Home Oil products are distributed. The officers of the company who are responsible for the erection of the Duncan building are: Mr. W.J. Blake Wilson, president; Mr. Auston G. Taylor, vice-president; Mr. W.W. Boultbee, secretary-treasurer; Col. Victor Spencer, Messrs. George Kidd, C.V. Cummings, George S. Harrison and H.G. Fowler, directors. The architect for the building was Mr. W.F. Gardiner, Vancouver. The attractive design and arrangement are tributes to his good work. The construction was well carried out under the general supervision of Mr. John Beckwith, Eburne, B.C., who was the general contractor. An inspection of the building reveals good workmanship throughout reflecting credit upon the general contractor and all sub-contractors, as well as the firms supplying the materials. The plumbing was done by J.L. Hird, Duncan; the electrical work by the Richardson Electric, Vancouver; the roofing and tinwork by Campbell and Grill, Vancouver; plastering, W. Keen, Vancouver; painting, George Scroxton, Vancouver. The lumber throughout was supplied by the Hillcrest Lumber Co. and the cement came from the B.C. Cement Co., Bamberton and Victoria. The hardware was supplied by Cowichan Merchants Limited and hauling of the sand and gravel was done by Charles Pitt. In the early 1940s, 25 Craig Street became a thrift store, run by Norman Gourlay and his mother Margarite Gourlay. This business was located here until 1972, when Powel’s Men’s Wear, which had been operating next door at 45 Craig Street since 1933, expanded into 25 Craig Street. Powel’s Men’s Wear was in business at 25 Craig Street and 45 Craig Street from 1972 until 2004, when it closed its doors after over 70 years in business in downtown Duncan. In 2004, the Craig Street Brew Pub moved into 25 Craig Street and has been active in this building since. Just Jake’s Restaurant, next door in another historic Duncan building at 45 Craig Street, is also part of the Craig Street Brew Pub operations. 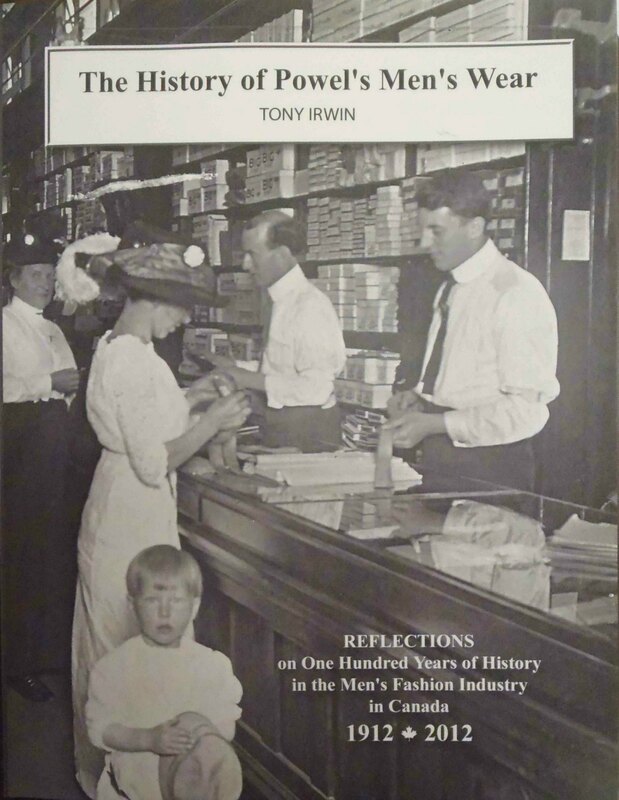 If you are interested in a copy of this book, please contact Tony Irwin at adirwin@shaw.ca or enquire at Volume One Books.